The presence of Cardinal Patron Burke at the International Lourdes Pilgrimage 2018 is apparently not desired. (Rome) 160 years ago, in 1858, the Mother of God appeared in Lourdes. This event is being commemorated in the Catholic World in 2018. 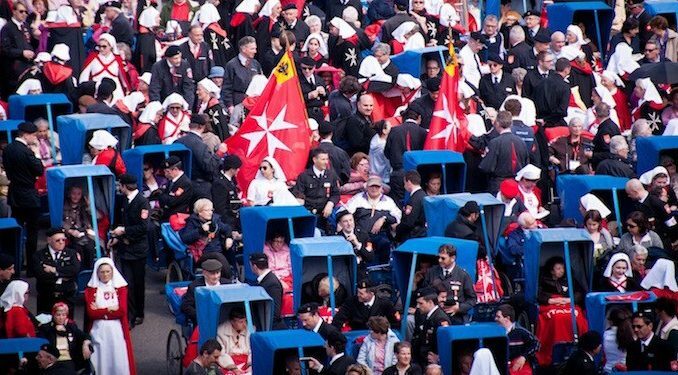 From the 4th to the 8th May the 60th International Lourdes Pilgrimage of the Order of Malta takes place. According to the current status, 6,500 knights and ladies and their companions as well as 1,300 sick and disabled pilgrims will participate. According to information, Cardinal Burke, although Cardinal of the Order, was not invited. The information comes, according to the traditional French website Riposte Catholique out of the new religious leadership related sources. Already in 2017, the cardinal had not been invited, after papal intervention had forced him to replace the head of the Order. Cardinal Raymond Burke opposed the policy of Pope Francis to soften the sacrament of marriage during the first Synod of Bishops on the Family in October 2014. The cardinal denounced actions to manipulate the synod and criticized a break with Church doctrine and practice. After the conclusion of the Synod, Pope Francis suspended him from the then prefect of the Supreme Court of the Apostolic Signatura in the course of a purge and removed him from the Vatican. Francis sent the US Cardinal as cardinal patron to the Sovereign Order of Malta. Although this is a prestigious office, it lacks any influence on the leadership of the universal Church. At the turn of the year 2016/2017 there was a conflict between the then Grandmaster Fra Matthew Festing and his Grand Chancellor Albrecht Freiherr von Boeselager. The latter called for help from the Holy See, who jumped to his side. In a less elegant way, the Grand Master was demoted within a few weeks and forced by Pope Francis at the end of January 2017 to resign. Boeselager was again used by Francis as Grand Chancellor and is considered since then the real powerhouse in the Order. At the same time Cardinal Burke was also disempowered. De jure he remained cardinal patron, thus the official representative of the Pope in the Knights and Hospital Order, but Francis appointed Curial Archbishop Angelo Becciu, as the substitute of the Cardinal Secretary of State, a special representative with the responsibilities of a papal commissioner. Cardinal Burke was accused of having helped Grand Master Festing to take Catholic morality too seriously. Unlike Cardinal Gerhard Müller, whom Francis showed the door more elegantly (officially after the end of a regular term of office), Cardinal Burke has at least one office on paper. Last Saturday, the cardinal in Rome participated in the conference "Catholic Church Quo Vadis?" In the main, Cardinal Burke had called not only upon the possibility, but the duty to criticize the Pope, if he should deviate from the Catholic doctrine and practice. 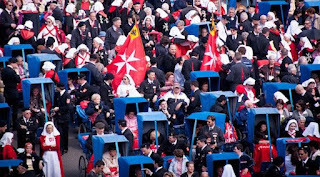 As early as the 59th International Lourdes pilgrimage of 2017, the new leadership under Boeselager indicated that although Cardinal Burke must be tolerated as a cardinal partron, he was persona non grata in the Order. After his appointment as cardinal patron in 2015 and 2016, Burke had led the annual pilgrimage and celebrated Holy Mass in Lourdes for pilgrims. Also in 2018, according to the information within the Church, he believes that he is not welcome to the International Lourdes Pilgrimage. The fact that it is the 160th Anniversary of the Marian apparitions, could change nothing. Those who contradict Francis have a difficult time and it is not just persona non grata at the Holy See where they are treated without mercy. Let's take a deep whiff of reality. "Amoris Laetitia" did indeed "relax" the interpretation of moral doctrine in the Catholic Church. It advocates leniency for adulterers, fornicators, and sodomites. There is no other interpretation. Cardinal Burke "balked" at this and is now being ostracized.--It also must be emphasized that this ostacizing did not start with Francis. It began under the rule of Benedict in 2008 when Burke was removed as Archbishop of St. Louis and given a "paper" title in the Vatican to keep him out of the spotlight. I have emails from the Chancery which give explicit proof that Burke was removed through the alliance of Justin Cardinal Rigali who had just left St. Louis for Philadelphia and a cabal of radical leftist Catholic politicians.---I attended the farewell Mass for Burke in August of 2008. He was removed just before the election of then Senator Barry Obama. At the Mass as Burke and his entourage entered the Cathedral, I was given a supernatural sign that the Church was on the verge of being shaken to its core.----It must also be remembered that the traditional church here in St. Louis under the auspices of now Cardinal Burke had a purge of its leadership just after Burke left. I attended a Mass where the preacher stated that Senator Obama was a modern day Herod for his butchering of the innocents. This ruffled some feathers at the Chancery. The auxiliary bishop who stood in after Burke was removed ordered an immediate visitation of the Oratory for one week. At the end of the visit, the rector was removed and sent back to Germany and a replacement sent. The offending priest was exiled to Kansas City.----This is all about the destruction of the traditional Church and its replacement with a socialist (some say Communist) model. Many criticize Cardinal Burke--both on the "right" and even more from the "left". He is called a "cowardinal" and other names and many wonder WHY does he not do something more? But can he? He is one man. He has faced the consequences of ridicule, demotion, calumny, etc. for standing up for the truths of the faith. One man cannot depose a pope. One cardinal out of many has no power to do other than what he is doing: speaking the truth in the public forum whenever and wherever he can. Many Catholics were badly let down by ++Burke when he promised a formal correction after the Epiphany last year but didn't issue it. No reason was given, nor was there any regret for not fulfilling that promise. Although it was reported that 30 Cardinals supported him, he said numbers didn't matter to him only the Truth & his own judgement. It would be mind-boggling if he did not do his homework before issuing that promise so someone must have stepped into the fray with enough clout to stop the correction from being made. Was it the since sacked ++Müller or was some compromise made? The last people to be told, it would seem, are the laity. If the red hat stands for martyrdom, then the whole Hierarchy should be made hand theirs in, as none of them have shown such fidelity to Christ. 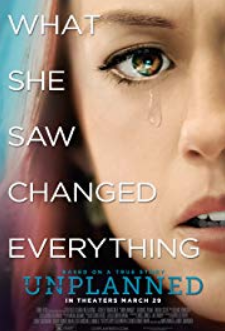 Since then many atrocities have occurred too many to list here, but the more recent being the +Barros affair & his victims being slandered by PF who immediately put the blame on not getting the truth from those who knew it. No reference was made to the letter handed to him on camera b y ++O'Malley! Then there was the reiteration of no Hell & the scandalous & imminent betrayal of Chinese Catholics, none of which has been publicly condemned by ++Burke, or any other Cardinal for that matter. Traditional Catholics have a right to feel abandoned - first by PBXVI & now by ++s Burke & Brandmueller. Ray Burke validates the 'Peter principle' which states that people like him are promoted beyond their abilities/competence. He is basically a legalistic bean counting God-bother who was catapulted into the episcopate by his ideological patrons. When the big leadership tests in La Crosse and St Louis came, he was found dismally incompetent. When, at the pleading of the USCBC, he was 'moved and promoted' by Benedict to the Apostolic Signatura, despite some very good decisions, was also found to be wanting. Ray is at heart a small time narcissistic cleric who attempts to compensate for the enormous gaps in his personality but donning the symbols of power. He should read Sirach. There's a lot of sage advice in that book about delusions of grandeur and presumption. He may not be Mr. Personality but he still deserves to be treated with respect. For shame!!! Ray is at heart a small time narcissistic cleric who attempts to compensate for the enormous gaps in his personality but donning the symbols of power. He should read Sirach. There's a lot of sage advice in that book about delusions of grandeur and presumption.<------EXACTLY!!!!! He is a sad case. Everybody is always compensating for what you lack. Your post is sinful. To tell lies about another person is called calumny or slander. To reveal the hidden faults or sins of another without sufficient cause, in such wise that the person's reputation or good name is seriously damaged, is called the sin of detraction." As a recovering Novus Ordite, I find that many in the Vatican II sect have a very sensitive radar about anything traditionalist, whether in pious devotions that have been discarded, or in the Tridentine Mass, or in traditional orthodoxy and have no qualms about bad mouthing the faithful and orthodox in the Church. The fact that the USCCB pleaded for his removal, tells you everything you need to know about Cardinal Burke being right. The USCCB, much like most of the post Conciliar Church are in apostasy, and unless the individual members repent of their errors, will be damned. Our Lady was so right when the still unrevealed third part of her Fatima secret said "In Portugal, the dogma of the faith will be preserved, etc". She was speaking of EENS. He was too Catholic for the illuminist boards at Catholics Hospitals, Colleges and Charities in his diocese. at hospitals, colleges and “Catholic” charities in St. Louis. Thomas Allen - you nailed it. Recall when Pope Francis directly criticized demotion by promotion? I think that's what Benedict did when he promoted Burke as Signatura. Big mistake. And man, did Burke go nuts with all the regalia and prestige. Still no objective assessment for Burke's abilities from Gaybrielle. Burke may not be very good at betraying Christ like many of his confreres, but just what is it that makes a good bishop these days, according to you? God will judge His Eminence Cardinal Burke & I, personally, do not think he will be found wanting. Shame on his detractors!!!! !